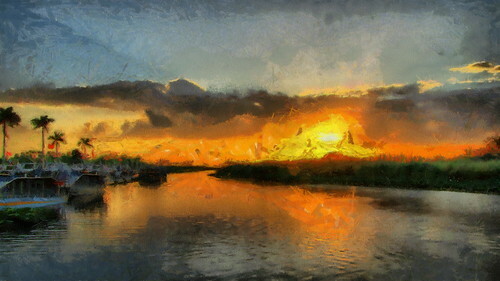 Sunset over the Everglades – March, originally uploaded by QuakerVille. The Everglades begins just below the sugar cane fields in Palm Beach County and runs over a hundred miles to the south where it ends up in Florida Bay just below Everglades National Park. Many people think that the entire Florida Everglades is a National Park but only a small percentage is actually owned by the Park Service. Most of the Everglades meander west of Palm Beach, Boca Raton, metro Fort Lauderdale, and past Miami before it feeds into the National Park just below and west of Homestead. Actually, thousands of square miles of Everglades feed the National Park part of the ‘Glades before it meets the National Park. In the past year or so I have spent about 20% of all weekends taking pictures somewhere along the edges or through the center of the Everglades, either in the western part of Broward or Palm Beach county or even in the National Park. The sheer beauty of the ‘Glades makes any photographer snap away at either wildlife or scenery. There is plenty of each to capture. One spectacular place that Jo, my wife, and I seem to visit regularly is a state park called Holiday Park. It’s at the far west end of Griffin RD west of US 27 and it is beautiful. The sunset is usually spectacular from the edge of the waterway as it was the evening I captured this picture. The sun was glowing from behind the sawgrass reflecting the warmth of the evening on the shimmering alligator filled waterway. I say that because just 10 feet to the right was an 8 foot gator lazily swimming toward the far shore just out of sight. The photograph alone is beautiful but I’ve added an extra touch of art by processing this sunset photo with a “felt tip” process using the Mediachance DAP2 software which actually re-draws the picture using techniques from artists using the media of choice. This picture will be further processed on canvas for a hand painted look and hung on a wall. I hope you enjoy this picture as much as I enjoyed taking and processing it.